The Burroughs High boys’ basketball has had its ups and downs this season. The Indians played one of their finest first halves of the season against Burbank High Friday night. It was so good that it was enough to help the Indians avoid a fourth-quarter meltdown in a 66-61 Pacific League victory. “It was a tough fourth quarter but we had to keep our composure and that’s what I kept telling my teammates,” said Burroughs Emery Goulet, who had a game-high 32 points. Burroughs (10-11 overall, 3-5 in the league) held a 55-38 lead going into the fourth quarter and appeared to be in command for a victory. 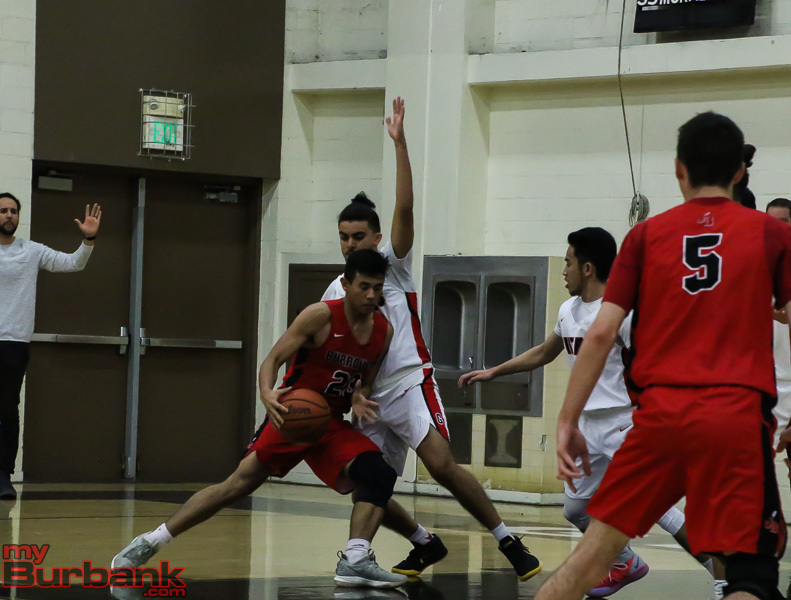 But Burbank (12-8, 4-4) began the fourth quarter on a 14-0 run and tied things with 2:43 left on a pair of free throws by Jared Pasion. The Bulldogs would later take the lead on two occasions before Goulet put forth a final push that was enough to lift his team to victory. “We were running too many plays that were complicated that they weren’t really used to running, so we simplified it and starting running spreads,” Burroughs coach Allan Ellis said of his offense. Ellis said the change allowed his team to get more open looks at the basket. Burroughs hit 11 three-pointers as a team. Ellis said he knew his team could not afford to get too comfortable, even with a double-digit lead. “Burbank did a great job fighting back in the fourth quarter and I expected them to fight back at some point. We weren’t executing very well. Once we got back to our execution in the last minute or two minutes, we started to find our rhythm again,” Ellis said. Burbank coach Ernest Baskerville was frustrated that his team didn’t come out on top. Burroughs, which led 15-12 at the end of the first quarter and 33-22 at halftime, got 13 points from Bryan Oasey. Sammy Solis added eight points and Nick Garcia scored seven. Carson Cardenaz had four points. Tyler Cantrell had two points. 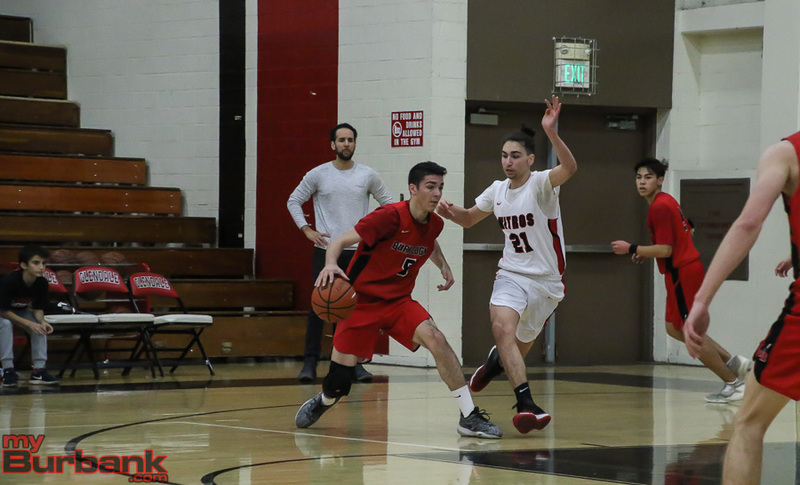 Burbank was led by Leo Tahmasian and Erik Harutyunyan, who each had 15 points and Miles D’Agostin, who had 11. Pasion had seven points and Jalen Clark added five. Ben Burnham had four points and Isaac Anglade had two. Abiel Pearl and Guram Dumbadze each hit a free throw. 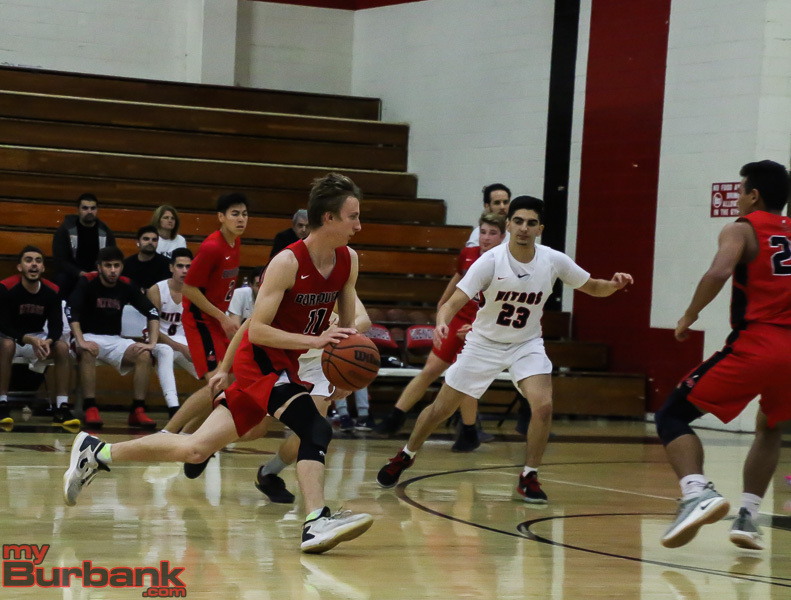 This entry was posted in Boys Basketball, Sports and tagged Abiel Pearl, Bryan Oasey, Burbank boys basketball, Burroughs Boys Basketball, Carson Cardenaz, Emery Goulet, Erik Harutyunyan, Guram Dumbadze, Issac Anglade, Jalen Clark, Jared Pasion, Leo Tahmasian, Miles D'Agostin, Nick Garcia, Sammy Solis, Tyler Cantrell on January 12, 2019 by Jim Riggio. 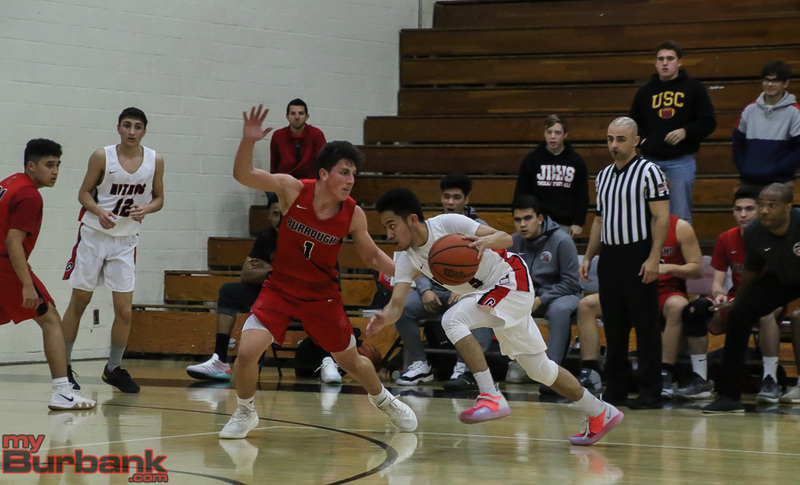 A deep and ugly hole faced the Burroughs High boys’ basketball team on Friday evening and it proved simply too much. Glendale jumped out to a 24-8 lead in the first quarter and then held off the visiting and gritty Indians 59-50 in a Pacific League encounter. After the putrid start, the Indians, who connected on 19 of 58 from the floor for 32.7 percent and outscored the Nitros, who drilled 22 of 49 for 44.8 percent, 19-8 in the second quarter, drew within 32-27 at the intermission. Sammy Solis paved the way for the Indians (5-6 and 0-2 in league) with a team-best 14 points while Emery Goulet chimed in with 11. Burroughs came out and hit on three of 12 shots from the floor in the opening period, but bounced back and drilled eight of 17 in the second frame as Solis scored eight points and delivered 10 points at the break. The Indians nailed four from three-point range at the midway point and added three more in the second half. Burroughs hit four of 15 from the field in the third quarter and four of 14 attempts in the fourth period. Bryan Oasay contributed five points in the third quarter after dropping in a free throw in the opening stanza and a trey in the second period. The Indians were outscored 10-9 in the third period and 17-14 in the fourth frame when Goulet tallied six points including a three-pointer. 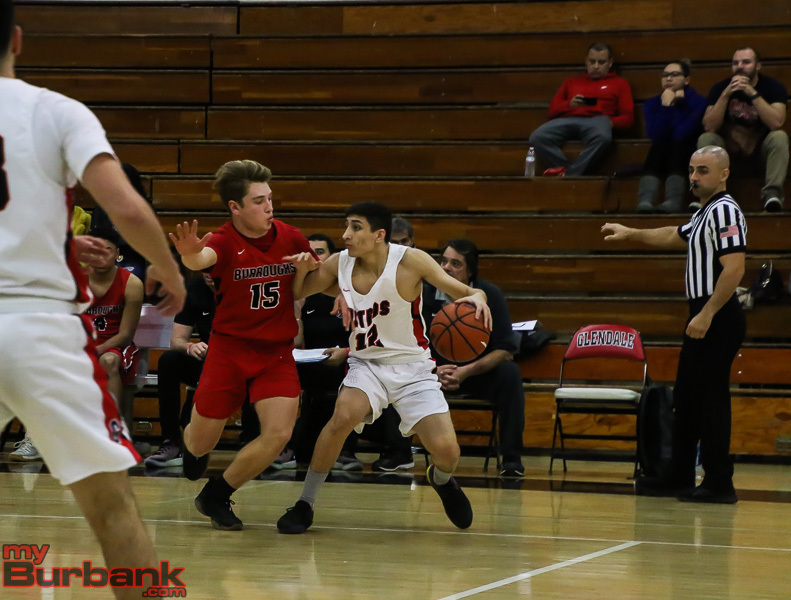 Leading Glendale’s offense was junior shooting guard Manny Kapoushian, who dropped in a game-best 17 points and hitting four of the seven made from three-point range. Kapoushian’s three-pointer with 5:49 left in the opening period handed the Nitros an 8-1 edge. A hoop by Solis with 4:43 remaining in the second quarter sliced Glendale’s advantage to 26-14. Senior point guard Cole Fajardo added nine points for the Nitros (8-3 and 1-1 in league), who made 13 of 28 shots for 46.4 percent in the opening half, with seven points by the intermission. When junior point guard Edgar Kirakosian (six points) drilled a three-pointer and four minutes showing, the Nitros, who took a 42-36 lead into the fourth quarter, surged ahead 52-39. Evan Zamora and Nick Garcia each chimed in with six points for the Indians while Carson Cardenaz dropped in four. The Indians canned seven of 12 free throws and the Nitros were successful on eight of 16 from the charity line. 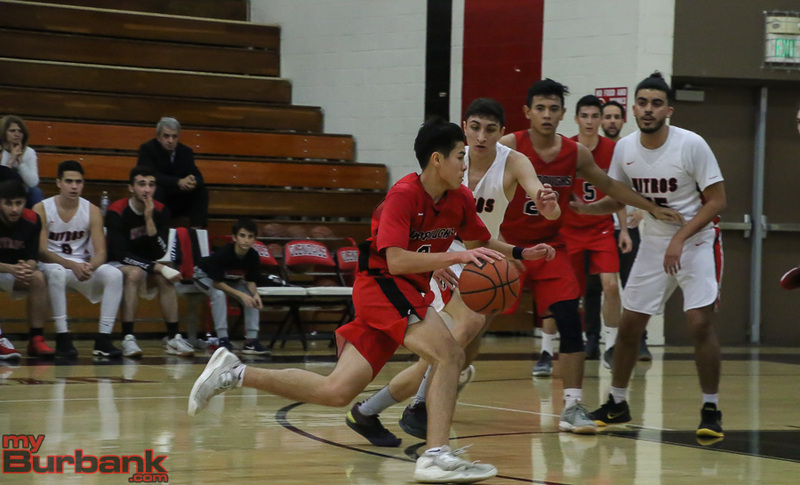 This entry was posted in Boys Basketball, Sports and tagged boys basketball, Bryan Oasay, Burroughs High, Carson Cardenaz, Emery Goulet, Evan Zamora, Nick Garcia, Pacific League, Sammy Solis on December 8, 2018 by Rick Assad. Both Burroughs and Burbank highs have enjoyed success in recent years in boys’ volleyball. Change doesn’t appear to be on the cards this season as both teams are looking to keep those traditions going. The eight-time defending Pacific League champions went 17-14 overall last year and 10-0 in the league. The Indians lost in the second round of the CIF Southern Section Division 1 playoffs to national power Huntington Beach. Two starters and seven players overall are back from last season’s team as the Indians have just six seniors on an 18-player roster. Outside hitter Diego Rosal (6-5) and opposite hitter Cole Kaitz (6-5) are both back. Senior Jose Solano (5-11) takes over at setter. Backing him up are junior Steven Grandenetti (6-2) and freshman Carter Cotrell (5-11). Junior Sam Tipton (5-9) takes over the libero spot from the graduated Skyler Bercini. He is backed up junior Luke Kvarda (6-0) and senior Marcus Sta. Maria (5-6). Junior Jagger Green (6-4) figures to be a key at middle blocker. 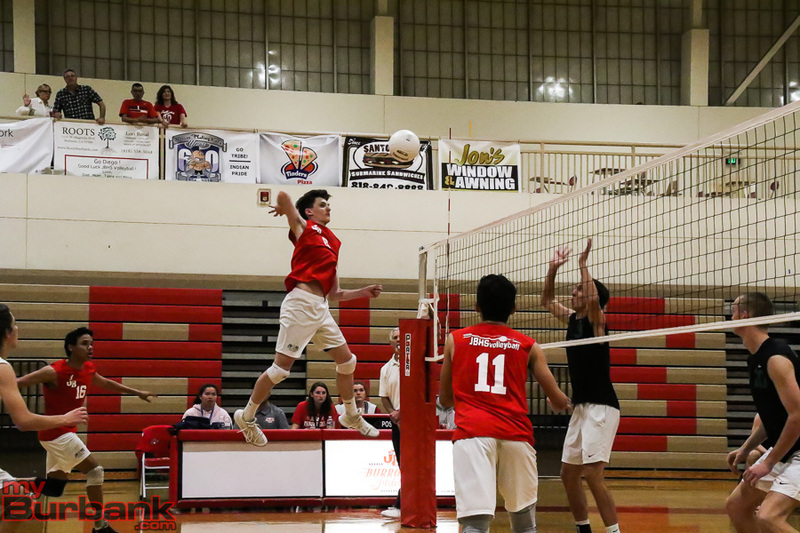 Seniors Diego Borja (6-7) and Drew Gorsuch (6-0) as well as junior Jack Weerts (6-0), sophomore Conner Burroughs (6-1) could also see time at middle blocker. Backing up Rosal are freshman Kade McGovern (6-3), as well as juniors Michael Rumfola (6-1), Caleb Reyes (5-11), and senior Azael Estrada (6-2). Sophomore Sammy Solis (5-11) will back up Kaitz. The Bulldogs went 22-14 last year to finish third in the league. They lost in the first round of the CIF Southern Section Division 2 playoffs to Long Beach Wilson. Karl Rojo, who has been the coach of the girls’ team, is now coaching the boys’ team as well. 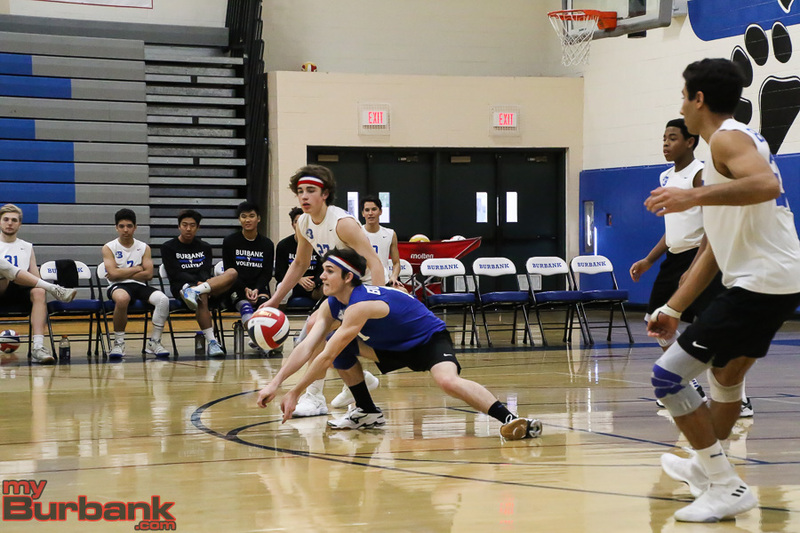 Senior outside hitter Jonathan Ragheb (6-0) is a key returner and team captain. Senior Rory Rickey (6-2) also returns and will play middle blocker. He is backed up by junior Dawson Koerper and senior Jonathan Valmonte. Senior Edward Curren (5-8) is a team captain and the starting libero. Junior Ryan Mehta (5-5) is his backup. Senior Brian Valmonte (5-10) is the setter and is backed up by junior Brian Villaflor. Junior Luca Bily (5-11) is a returner who will hold down the opposite hitter position. Senior Paul Won and junior Dylan Vivar offer depth at the position. Helping out in the outside hitter positions will be freshman Jonathan Coleman, junior Ryan Rickey (5-8), sophomore Kourosh Dolatshahi. This entry was posted in Boys Volleyball, Sports and tagged Azael Estrada, Brian Valmonte, Brian Villaflor, Burbank boys volleyball, Burroughs boys volleyball, Caleb Reyes, Carter Cotrell, Cole Kaitz, Conner Burroughs, Dawson Koerper, Diego Borja, Diego Rosal, Drew Gorscuh, Dylan Vivar, Edward Curren, Jack Weerts, Jagger Green, Jonathan Coleman, Jonathan Ragheb, Jonathan Valmonte, Jose Solano, Kade McGovern, Kourosh Dolatshahi, Luca Bily, Luke Kvarda, Marcus Sta. Maria, Michael Rumfola, Paul Won, Rory Rickey, Ryan Mehta, Ryan Rickey, Sam Tipton, Sammy Solis, Steven Grandenetti on March 11, 2018 by Jim Riggio.